Max Keilwerth was the younger brother to Julius. Max was born in 1898 (Julius in 1894). Both learned their craft in Graslitz, Sudetenland, with Franz Than. If that name sounds familiar, it might be because Josef Dörfler—of Dörfler & Jörka fame—also did his training with Than. Like Julius, Max Keilwerth worked out of the home-based workshop to finish saxophones for Oscar Adler. In 1923 Max began building up the saxophone division of Graslitz-based, musical instrument manufacturer, F.X. Hüller. Just a short while later he began his own business, which supplied Oscar Adler, as well as F.X. Hüller, with saxophones. 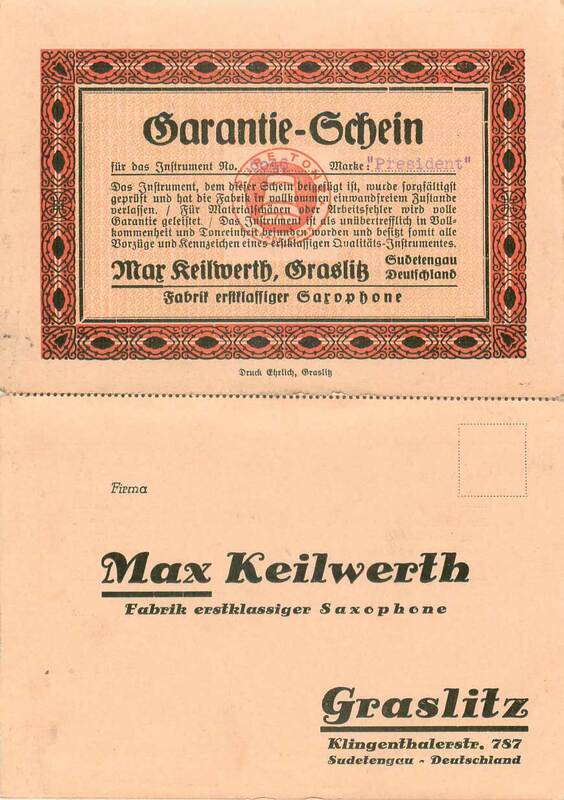 According to German sax historian Uwe Ladwig, Max Keilwerth’s own brand of horns were called Mars.¹ He also used a stamp that read Pure Tone Trade Mark, and it had a stylized bell as a logo. This logo also appears to have been stamped on the Max Keilwerth stencil horns, much in the same way that Julius’ Best In The World logo was. The stencils names that have been reported to Max Keilwerth credit include: C. A. Wunderlich, Admira, Tonemaster, Harway, and Musicator. We know that shortly after WWII, Max Keilwerth moved to what was then West Germany, and ended up working for Hohner in Trossingen. There he developed the Hohner President, and was responsible for the saxophone department from 1949, until his retirement in about 1967. However, before he worked for Hohner, it appears that Max developed an earlier model of President, which carried his Pure Tone Trade Mark. This is a copy of a warranty/guarantee card that I was sent by a fellow from the US. His grandfather brought both this tenor, as well as another Max Keilwerth saxophone, back from Germany after WWII. I am still trying to find some good, clear photos of Max Keilwerth-made President saxophones. For the most part I have only fuzzy, small side shots, that show very little detail. 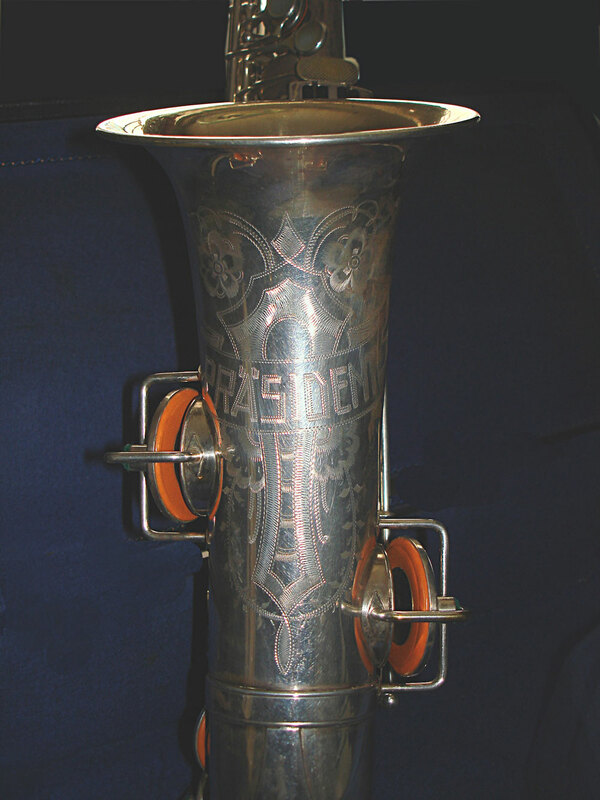 So far this is the only large, clear photo of the bell engraving of a pre-Hohner President I have been able to find. 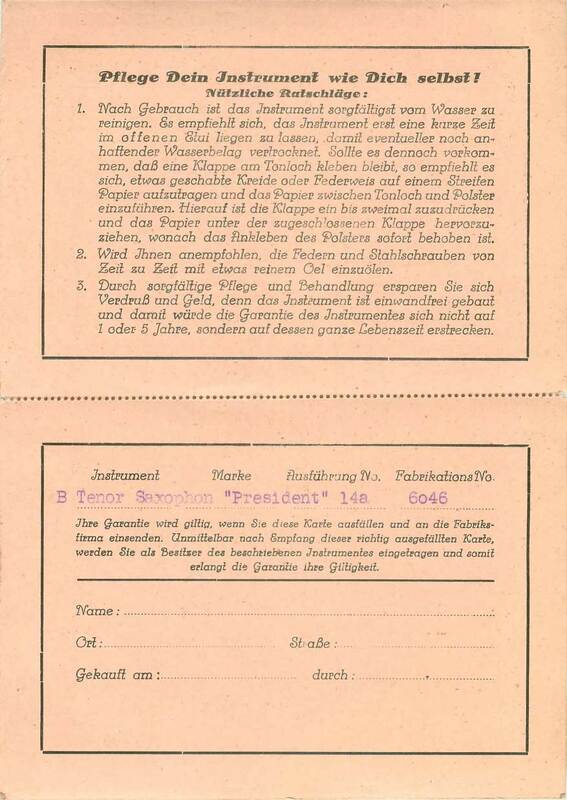 Notice the German spelling of Präsident, and compare it to the English version on the warranty card for the Max Keilwerth tenor shown above it. The alto shown here is a very early serial number (1223), compared to the tenor from the warranty card (6046). It would appear that at some point—either during or after WWII—Max Keilwerth anglicized the spelling of the model name to President. Based on the photos of the Max Keilwerth-made President saxophones I have seen to date, at this point it is safe to say that these horns had microtuner necks, split bell keys, and some, but not all, had very pronounced bow guards. This is consistent with the other saxophones that I have in the Max Keilwerth gallery in Bassic Sax Pix. If you have a Max Keilwerth-made President with the Pure Tone Trade Mark, I’d love to hear from you. If you’re willing to share some photos, even better. Even if your sax isn’t a President, but carries the Pure Tone Trade Mark stamp, I hope you still get in touch with me. It would be nice to collect as many photo samples as possible of Max Keilwerth’s saxophones. To date there has been no cataloguing of this Keilwerth brother’s saxophones. ¹ The source of much of the information for this page is from Uwe Ladwig, in der deutschen Fachzeitschrift—German music journal—SONIC sax & brass.